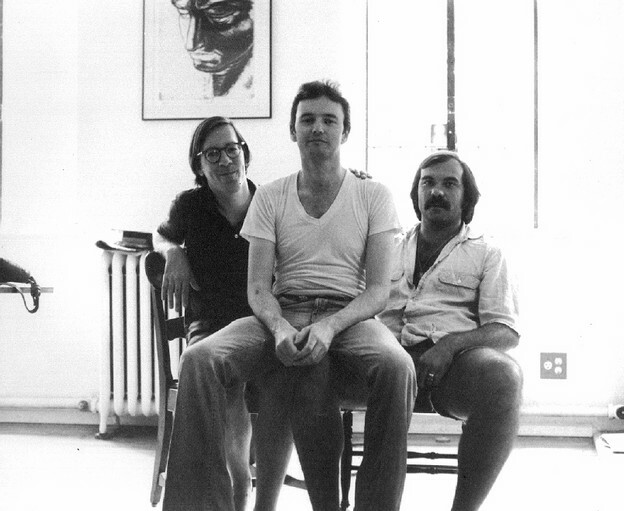 We all came to NYC in 1975 — Michael in May and Bruce and I in August-September. Michael and I had become friends in 1967 while at the Iowa Writers Workshop and been in regular touch since. I published Michael's first book What Withers in the Spring of 1970 (along with collections by Merrill Gilfillan and Robert Slater) under my Doones Press imprint. Bruce first wrote to me and sent poems in the summer of 1970. I was teaching in the MFA Poetry Program at Bowling Green University in Ohio at the time and was about to leave for a year in Europe. The arrival of Bruce's work was curiously coincidental. Michael and his family had driven up from Maryland to visit me for a few days and I showed him Bruce's work. At that point Michael hadn't met or heard of Bruce. However, he and Bruce were to meet shortly thereafter in a DC bookshop — as I remember Michael later telling me — they were both reaching for the same book at the time. Bruce and I spoke on the phone once or twice and were in touch through the mail with some regularity between 1971-75 — but didn't meet until 1975 in NYC. This photo marks the first occasion the 3 of us were in the same room together. DiPalma’s literary archive includes correspondence, manuscripts, printed materials (largely little magazines), one of a kind book works, and documentation of collaborative projects with other writers and artists. Autograph journals and notebooks and heavily edited typescripts as well as many manuscripts of other poets and fiction writers, often with autograph corrections, are also present in the collection. Materials in the archive, such as correspondence with Charles Bernstein, Lyn Hejinian, and Ron Silliman, document the L=A=N=G=U=A=G=E Writing community of the 1970s and 1980s. The archive has a significant international component, including correspondence with contemporary French poets, editors, and translators.